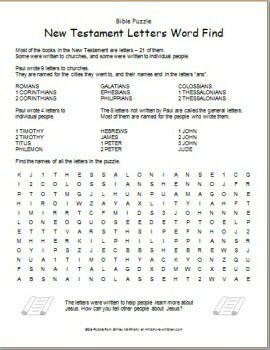 This word find contains all 21 letters in the New Testament. It also classifies them by Paul’s letters to churches, Paul’s letters to individuals, and general letters. It could be used for any lesson about New Testament letters or their writers. Related: This activity sheet would be a good complement to our Books of the Bible Bingo game. For a song, the kids will enjoy the Bible Book Song from Bigsby. If you’re starting a whole teaching unit about the Bible, start with our worksheets that teach about each Bible division (law, prophets, etc.). What’s your favorite New Testament book to teach children? What book in the New Testament is the most difficult for preschoolers to pronounce?